Know your History -- Thursday July 28 2016 marks 101 years since the United State invaded Haiti... The U.S. occupation of Haiti began on Wednesday July 28, 1915, when 330 US Marines landed at Port-au-Prince, Haiti, on the authority of US President Woodrow Wilson. KREYOL: Eske w konen? Jodi a make 101 lane depi Soldats Americain te debake en Haiti pou ocupe nou - Occupation Americaine te konmanse yon jou Mercredi, 28 Juillet 1915... Ou kwè li ko fini? Kisa ou panse de sa??? On July 28, 1915, American President Woodrow Wilson ordered 330 U.S. Marines to occupy Port-au-Prince. Secretary of the Navy instructed the invasion commander, Admiral William Deville Bundy, to "protect American and foreign" interests. Wilson also wanted to rewrite the Haitian constitution, which banned foreign ownership of land, and replace it with one that guaranteed American financial control. To avoid public criticism, Wilson claimed the occupation was a mission to "re-establish peace and order... [and] has nothing to do with any diplomatic negotiations of the past or the future," as disclosed by Rear Admiral Caperton. Only one Haitian soldier, Pierre Sully, tried to resist the invasion, and he was shot dead by the Marines. 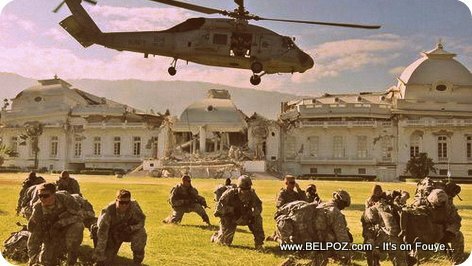 Read more about the United States occupation of Haiti from Wikipedia.